WE THE PEOPLE is the most recent body of work from the collaborative duo, Makos and Solberg. After years in and out of China, they've witnessed the second eye open of the Sleeping Giant. 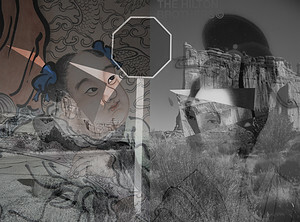 Through collage, the duo tells stories of the parallels and contradictions of American and Chinese culture. The old world becomes new again and the new world confronts its adolescence. Makos and Solberg regularly drive through the Great American west, from Navajo Nation to the Canyonlands USA; then on a train headed to Xi'an or Chengdu, Beijing or Shanghai. Along with their own pictures, they’ve collected American and Chinese iconography, reflecting the symbolism, myths, and truths of the two goliaths. Spending an afternoon with a Colorado rancher or with farmers living along the Great Wall, the duo is drawn to the common thread of both cultures, with their camera as their sewing machine. Warhol famously chose Mao as a subject matter after his impressions from Mao's "Little Red Book". Like many Chinese artists of the 1970's and 80's, Ai Weiwei responded to the populist nature of Warhol's work, with the ‘Warhol Diaries’ as the first window into Pop Art, emerging from America. Chinese artists saw Warhol as a liberating figure, and freely borrowed from American art to find their new Post-Mao-global voice. Ai Weiwei effectively drew from the visual vocabulary of western pop art to remark on social issues in China. Makos and Solberg continue in this tradition of social commentary in WE THE PEOPLE. They explore the old world's confrontation with the new. Who we are and who we were. Technology confronts culture as distance is measured in bandwidth instead of miles. Automation replaces man while man struggles with its post-automation-identity. Both cultures, while victims of self-satisfaction, maintain a blustery optimistic spirit. Through their pictures, Chris and Paul propose questions of national identity, patriotism, cults and fame and cultish fame. While the voice of the American Cowboy has softened, the bravado of a new Cowboy is heard across the Pacific. As the middle class shrink in the west, the voice from the east echoes through the Americas, Africa and beyond.